The humble parcel that arrived today and brought such joy! Just before lunch Jessica place this upon my desk. 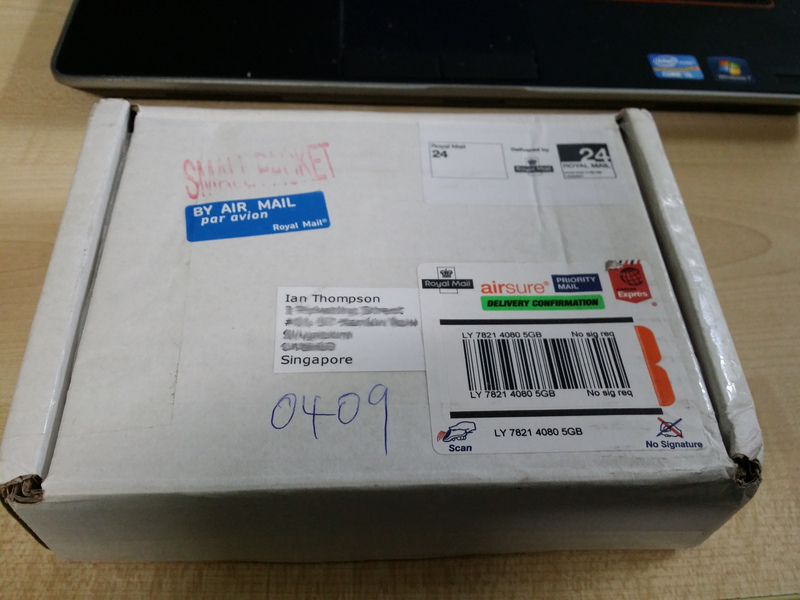 The first thought I had was that SingPost had found my missing parcel and delivered it to me. Then I remembered they said it would just be returned to England by the slowest boat possible. This then must be the replacement aircraft I ordered. The usual internal debate then raged – go out and have lunch then come back and open the parcel or buy sandwiches to bring back and munch on whilst opening the parcel and reviewing its contents. Given Thomo’s desire lately to shed a few kilograms (and preferably not by Dr Erik Bloodaxe’s method any more), a light Thai lunch won the day. Lunch was gobbled and some fruit was purchased then it was back and into the parcel. I opened the box and there inside was aircraft. Lots of them. Il-38, Tupolev, Neptune, Orion, Sea King, Sea Stallion, MiG-21 and so on. In fact the parcel contained all the aircraft I will need for the Japanese, Chinese and Indian fleets I’ve painted or am in the process of painting. I also ordered some of the aircraft bases. The are small and chunky but should actually work quite well with my ships bases. The last item in the packet was some bases cut to Flames of War size. 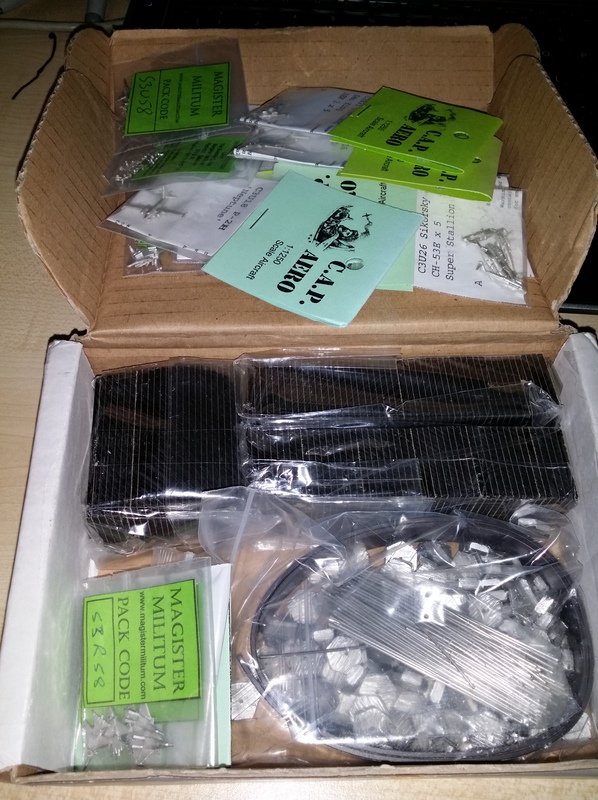 These will go under my 6mm Ros & Heroics/CinC/GHQ World War 2 Japanese. The only thing missing was a packet of MiG-29s which is on backorder and which I was using to represent another type of aircraft. The really fun inclusion in the packet was the missile pack. There are apparently 15 missiles in each of those packs. I was tempted to string them up under the aircraft wings but I am having a thought at the moment that maybe I should somehow make them up to represent missiles rushing towards their targets for use in the game. Still pondering how to do that! When I would it out I’ll let you know. painted pipe-cleaners look great for missiles, though these days, they are not called pipe cleaners. Yeah – I thought of that too. Also, the bases that come from Magister Militum are wee little hexagons. I’m testing on the Tu-16 and the Il-38 – if they hold those they will be fine for all the small stuff. The bases are about 10mm diameter and 3mm thick with a slot cut into them presumably for the magnetic tape – although the tape is about 3.5mm thick. I have a few hours experimentation coming up between now and Sunday.